Tackling Indian food can lead you down a pretty deep rabbit hole. The dishes are layered with an amazing kaleidoscope of spices, most of which the average cook doesn't keep on hand. Then there are the legumes themselves. Even the humble chickpea exists in multiple varieties and forms. But there is an easy way to make amazingly delicious chana masala without a lot of fuss. The secret is discovering authentic spice blends, and then simply following the instructions on the box. I kid you not. The good folks at Kashmir Market helped me find the MDH brand of spice blends, and it's widely available at many of our local South Asian grocery stores. To save you time, and energy, I've worked out the proportions to use an entire box of the spice blend, with two pounds of dried chickpeas. It makes an incredible amount of food, but all of these bean dishes freeze and reheat well. So put some away, and pull it out for a quick and delicious weeknight dinner. You will need two pretty big stockpots. Take 2 lbs of dried chickpeas, pick them over, rinse them, cover with three inches of water, and soak overnight. Drain and re-cover with water. Bring water to a boil then reduce to a simmer for about an hour until beans are al dente. While beans are cooking, sautÃ© in the second pot two large diced onions in plenty of canola oil and 1.5T of salt. Mrs. Fussy hates onions, so I turn down the heat and sweat them for as long as possible. Drain the beans, and have them ready. Strain a 28 oz. can of diced tomatoes and have them ready. Dump the spice mix into the onions and stir over medium-high heat for a minute. Dump the diced tomatoes into the spice mix and stir for another minute. Dump in the beans, and stir to distribute the spice-onion mixture throughout. Cover with cold water by about an inch, add 2 rounded teaspoons of baking soda (oddly), bring to boil and reduce to simmer. Simmer uncovered for about 40 minutes until water is reduced to a thick gravy and the beans are tender (adding more water if needed). Once you make this at home, and realize how easily you can produce a massive amount of delicious food for a measly $6, it may be difficult to order one portion of this dish at an Indian restaurant. My black bean recipe comes from one of my best friend's Cuban step-grandmother. In Cuba people eat these every day. There it is largely because of economic necessity. Part of the secret to these intensely flavored beans is to soak them with diced green pepper overnight, and then to cook them in their soaking liquid. 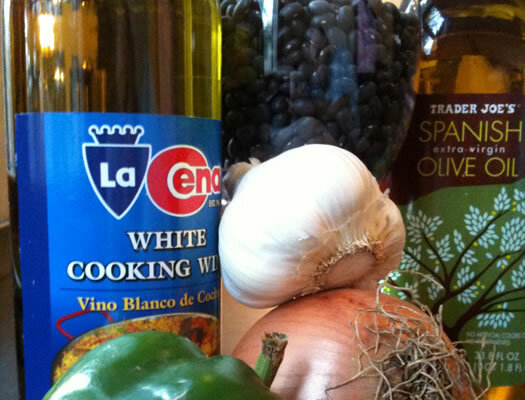 You will need one specialty ingredient, and that is the appropriate cooking wine. But it's readily available in the Latin section of the Westgate Price Chopper, and elsewhere. The supermarket can sell it because it's salted, and nobody in their right mind would drink it. These beans actually require a shocking amount of extra-virgin olive oil. Which is probably the most costly ingredient in the pot. Unless of course you decide to use organic green bell peppers, which might not be the worst idea. But even still, this is an inexpensive dish that makes a massive amount of delicious food that can easily be a meal unto itself, with rice and some fried plantains on the side. 4 Tb dry white "cooking wine"
Get a big big pot. Take 2 lbs of dried black beans, picked over just in case a small pebble wandered in. Measure 16 cups of water and pour into the pot with the beans. Take 2 green peppers, remove their seeds (personally I like to peel them too), chop and add to the water. Cover the pot and let it sit overnight. Grab a large sautÃ© pan. Take the pot of beans and boil for about 45 minutes or until they are soft. Chop 2 large onions, 10 garlic cloves and 2 additional green peppers. Put 1 cup of olive oil into sautÃ© pan. SautÃ© the vegetables with 2T of salt in the oil over medium/high heat until tender. Remove one cup of beans from the pot and mash them. Add the mashed beans to the vegetables and sautÃ© further, until melded. Put the vegetable and bean mixture back in the bean pot. Add additional 2t of salt, 1t pepper, Â½t oregano, 2 bay leaves, 2T sugar to pot. Bring to a lively simmer, and simmer for an hour. Add 2T plain white vinegar and 4T dry white "cooking wine". Simmer on low until reduced to your desired thickness. Finish the beans by mixing in an additional 4T of olive oil. It gives the beans a glossy finish and silky texture. It just so happens the first two recipes are vegan. But coming back to America we bring the meat. Here we know that beans go famously with pork. Luckily, Albany has Rolf's Pork Store, and his hocks are fantastic. If I'm feeling like an especially meaty version of this dish, I'll supplement with some smoked pork chop ends. 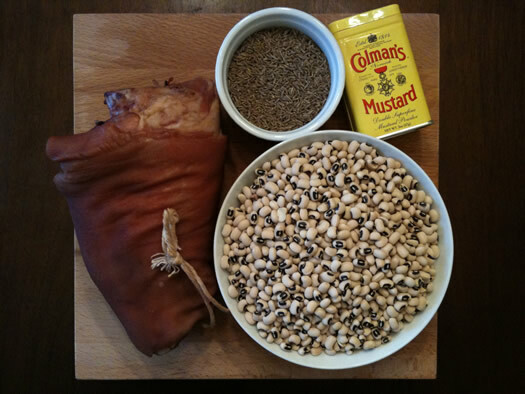 Speaking of luck, black eyed peas are supposed to bring prosperity in the new year. So now is the time to start working on perfecting this dish, so you can bust it out on New Year's Day. This recipe is adapted from one at A Southern Grace. Grace writes a food blog that is generally dedicated to the sweet and rich, so when she breaks form for something classic and savory, I perk up and take notice. These beans are full of earth and smoke. I omitted the fresh cilantro from Grace's recipe, as the ingredient is a non-starter in my household. Instead I tossed a little dried parsley in at the end of cooking to add a little color, and then opted to brighten up this hearty dish with a vinegary hot pepper sauce. It really demands Crystal. But like Grace, I spooned these over toast for a surprisingly satisfying and delicious winter dinner. Cover the black-eyed peas with water in a large pot. Bring to a boil. After 3 minutes, remove from heat. Cover and let sit for 1 hour. Add the water/broth, ham hock, cumin, mustard. Bring to a boil. Reduce to a simmer and cook -- with the lid on -- for 1 hour. The beans should be tender. Toss in the parsley, stir. Finish with the hot sauce to taste. And just because beans go great with rice, before I go, I'll share this fantastic technique for making perfect brown rice. In the summer I make it in the oven, but when the air in the house is dry, nothing beats doing them on the stovetop like this. These three dishes are just the tip of the iceberg. This winter I plan to be full of beans. For easy recipe printing: Here's a printer-friendly pdf of the three recipes. And if you're a smartphone/tablet in the kitchen kind of person, scanning the QR code on the right will take you to the pdf. 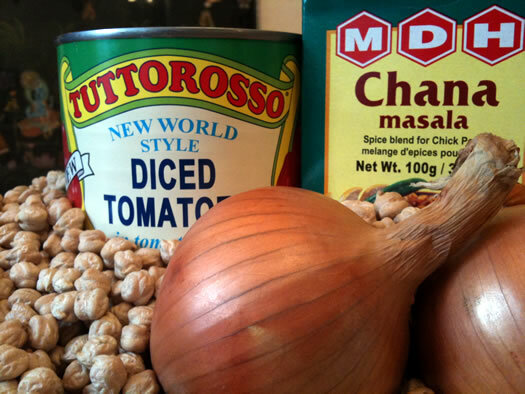 I am a cooking novice, what does adding the baking soda to the chana masala do? after the onions are sauted, chana masala actually comes out great in the slow cooker/crock pot. It supposedly softens the chickpeas, unsure if that's true. Soaking black beans with diced green peppers? SOLD. Thank you so much. Great recipes! I can't wait to try all three. Thanks also for the QR code - very handy. "3. Measure 20 16 cups of water"
Editors: Just a copyediting mistake. It should be 16 cups. It's fixed now. Thanks! Thank you for these recipes, especially the black beans. They always taste so horribly bland when I make them at home. Can't wait to make this! Marcie - There are two additions of baking soda. For the first addition (soak), B is right; it supposedly helps to soften the beans. I have read that certain B vitamins in beans break down in the baking soda solution, so some people discourage from using baking soda and just opt to soak the beans longer. The addition during cooking is most likely done to help alleviate gas. Whether this helps or not is a big debate, as many people will argue that some people cannot avoid the beans/gas combination. I goofed. My searches for an answer had me looking at a different recipe that had two baking soda additions, one with the soak and one with the cooking. Same reasoning applies. Sorry about that. Growing up in places where woodstoves were the only heat, I learned early that a pot of water on top keeps the place from feeling positively Saharan. Of course now I want to go home and make soup. I love the black beans. I have made this recipe before and it's delicious. I subbed white balsamic for the cooking wine and vinegar and added a little more salt because I didn't have the other two ingredients on hand and they still came out great. Since I don't eat meat, I like to add a little smoked paprika to my bean recipes, gives it a little bit of that smoky flavor. I'll have to try this brown rice method. Lately my brown rice always seem to come out on the mushy side even if I scale back the water. I imagine rinsing the rice first helps here. I grew up eating black eye peas and would urge anyone to try the classic preparation before embarking on this recipe which seems frankly weird to me. Soak the beans overnight, then slow cook with ham hock or salt pork and onions... the more the better. Some folks like the beans to cook to mush, others just to the point of tenderness. Remove the pork bones and onion, salt to taste, maybe add some olive oil if it's not unctuous enough, then serve with some trimmed scallions to munch on and what we call "pepper sauce"--tabasco peppers soaked in white vinegar; you leave the peppers in the jar and shake the liquid onto the beans. I made the chana masala last night....amazing. And the addition of the baking soda was transformative. It melded everything into something really spectacular. Daniel B -- do you think it matters if you use red cooking wine instead of white cooking wine in that black bean recipe? I was just at the Central Ave. Price Chopper with the great ethnic department getting the ingredients, but without the recipe, and was confronted with red and white cooking wine. I vaguely equated black beans to pairing red wine with beef -- or at least that was my logic for choosing the red cooking wine. I can go back and exchange it for the white as per the recipe, but just wondered what your thinking was on this. @chrisck - If you can believe it, I just saw this comment today for the first time. If you want to reach me directly, Twitter ( twitter.com/FUSSYlittleBLOG ) and Facebook ( facebook.com/fussylittleblog ) are always good options. But to answer your question, I would say the two wines are not interchangeable. There was no thinking involved in choosing white wine over the red. When you moan with delight as you taste the beans, and the Cuban grandmother who made them says to use white cooking wine, you use white cooking wine. No questions. No second guessing. No over thinking. The red wine could make an interesting variation. I've never tried. If you do decide to give it a whirl, please let me know. I'd be curious to hear how it comes out. But if it's not that great, I want you to promise me you'll try it again with the white wine, because those are spectacular (I can say that because it's not my recipe - it's not even my family's recipe).